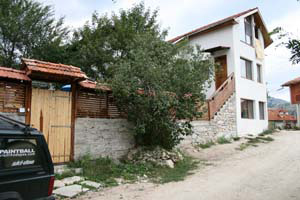 Guesthouse Kamenik is open for visitors from the Spring of 2009. It is located on the hill above the village square of Yagodina. The house is extremely comfortable and well appointed. If you are looking for beautiful scenery, relaxation and fresh air, visit us! Summers you will play Paintball in the shady forests, and winters will ride the snowmobiles. You will spend evenings at the fireplace will a cup of red wine.Welcome!